…because that as a man, when he shall die, appointeth his goods to be dealt and distributed after his death among them which he nameth to be his heirs, even so Christ before his death commanded and appointed that such Evangelion, gospel, or tidings should be declared throughout all the world, and therewith to give unto all that [repent and] believe all his goods: that is to say, his life, wherewith he swallowed and devoured up death; his righteousness, wherewith he banished sin; his salvation, wherewith he overcame eternal damnation. Now can the wretched man (that [knoweth himself to be wrapped] in sin, and in danger to death and hell) hear no more joyous a thing, than such glad and comfortable tidings of Christ; so that he cannot but be glad, and laugh from the low bottom of his heart, if he believe that the tidings are true (ibid., p9). The Reformation had placed an emphasis on the individual’s need for salvation and faithfulness to the gospel – a faith no longer mediated by the lofty metaphysics of priests and popes, but characterised by immanence, comprehension, and direct relationship with the divine. As Protestantism fragmented, a remnant retained their missionary zeal and a moral fervour. They became known as Evangelicals or ‘gospellers’ – those whose mission was to preach the message of repentance from sin and of an assured salvation through the blood of Jesus. But many Church of England clergy were irked by these self-styled preachers and teachers. Bishops and parish priests were God’s appointed guardians of the Faith, by order of the King. Just who were these fundamentalist zealots with their interminable focus on repentance, faith and holiness? But no matter how much the bishops tried to muzzle them, these Evangelicals carried on preaching. No matter how much the Church of England tried to rescue Christianity from the extremists, the spiritually dead turned away from their drunkenness, gambling and licentious behaviour, and were ‘born again’ in their thousands, being brought into a living personal knowledge of Jesus Christ which transformed their lives. For Evangelicals, the Word of God is the bread of life, which “ran as fire among the stubble”, as Wesley wrote in his journal. “It was glorified more and more; multitudes crying out, ‘What must I do to be saved?’ and afterwards witnessing, ‘By grace we are saved through faith. '” ‘Evangelical’ became a necessary term to distinguish Protestant gospel preachers from those who were dead in their sin or bound by the pervasive theological liberalism. The Evangelical Alliance, founded in 1846, was a Protestant fellowship of vibrant fundamental belief, not a denominational church organisation. Their unity was based on fidelity to Scripture and its transformative message of renewal – in both personal morality and societal spirituality. Membership was open to all churches which faithfully preached the Word of God, and to all Christians who had accepted the Lord Jesus Christ as their personal God and Saviour. It is no exaggeration to say that Evangelicals instigated and worked tirelessly for some of the most revolutionary policies in British social history, from mass education to the abolition of slavery; from poor law reform to prison reform; from the establishment of trades unions to the foundation of the Labour Party. Evangelical concerns did not stop at the salvation of souls, but extended into sewers, schools, factories and slums. Theirs was a moral mission for the renewal of society. As it was in England, so it followed in America, where men like Charles Finney conducted ‘revivals’ for those seeking salvation. For Finney, as with Wesley, the emphasis was on the individual’s freedom and responsibility to seek God. Our sin, in all its physical depravity and self-gratification, is overcome when the will is subject to the law of God. There is no middle ground to take; no compromise to be had. We are either dead in sin or alive to God. The moral character is the fruit of moral choice and moral action, and that morality is gleaned from the plain reading of the clearest understanding of Scripture. The progeny of Finney’s catalyst includes the Fuller Theological Seminary, the Billy Graham crusades, and the magazine Christianity Today, whose main concern has been to win a hearing for Evangelical orthodoxy. There have been many other important Evangelicals – such as Peter Forsyth, Benjamin Warfield, Gerrit Berkouwer and Helmut Thielicke – all concerned with the primacy of Scripture, the centrality of the Cross, the imperative of repentance, the importance of personal holiness, and the desire for social reform to conform to biblical morality. They had their theological, soteriological and ethical differences, of course, but were united in their opposition to the pervasive liberalism, which taught the love of God but denied His holy wrath against sin, thus propagating a gospel of sentimental inclusion. Some of the things that have been said by religious leaders seem to collude with a system that marginalises the poor, a system which builds walls instead of bridges, a system which says people on the margins of society should be excluded, a system which says we’re not welcoming people any more into our country. If people want to support rightwing (sic) populism anywhere in the world, they are free to do so. The question is, how are they going to relate that to their Christian faith? Whenever people say those kinds of things, they need to be able to justify that they’re saying those things as Christians, and I do not believe it’s justifiable. Some quite significant so-called evangelical leaders are uncritically supporting people in ways that imply they are colluding or playing down the seriousness of things which in other parts of their lives (they) would see as really important. Therefore thou art inexcusable, O man, whosoever thou art that judgest: for wherein thou judgest another, thou condemnest thyself; for thou that judgest doest the same things (Rom 2:1). Why is the Bishop judging entire lives and Christian ministries by what these Evangelicals are reported to have said about Donald Trump’s policies? Have they been quoted accurately? How does the Bishop know they are giving the President “uncritical support”? What Christian gives any secular politician uncritical support? Might the criticism be expressed but not reported? Does the mainstream media not like to extract a phrase or string together words in order to show their opponents and enemies in the worst possible light? Judge not according to the appearance, but judge righteous judgment (Jn 7:24). For Paul Bayes, it appears that any support for Donald Trump which isn’t prefaced with a divine health warning is unacceptable: you can’t support his tax cuts without decrying his immigration policy; you can’t support his job creation without decrying his border wall; you can’t support his pro-life inclinations without decrying his crassness and crudeness. And if, on balance, you still come down for Trump, well, you’re obviously a ‘so-called Christian’. What a world it must be in the Bayes’ household (and his diocese?) if every positive utterance about someone must needs be balanced with a negative, lest you give the impression of colluding with their sin. The President of the United States has 25 Evangelical advisors, who are not all pro-Trump by any means. 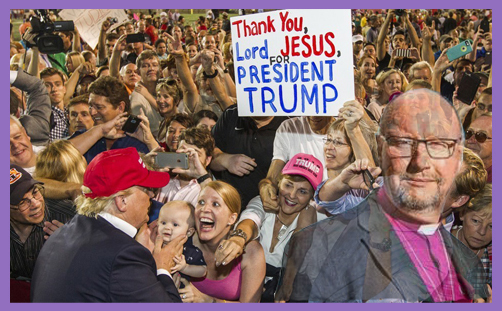 Presumably, if Bishop Paul believes those who are for him are not true Evangelicals, then those who are anti-Trump must be the genuine ones. But why stop with Evangelicals? The Guardian articles mentions the Pew Research Center finding that 81% of white Evangelicals voted for Trump. But that’s fairly consistent with those who voted for Romney and Bush (both on 78%), so it seems that 8/10 white Evangelicals tend to vote Republican. But these stats also suggest that 60% of white Roman Catholics also support Trump. Are they ‘real’ Roman Catholics, or just ‘so-called’ Roman Catholics? Why is the Bishop of Liverpool content to bash Evangelicals but not Roman Catholics? Is it more Christian to be anti-Evangelical than anti-Catholic? Isn’t it just possible that many of these Trump-supporting Evangelicals and Roman Catholics are more concerned with the mass murder of babies in the womb than with the poor and marginalised? Is contending against abortion not also a noble and righteous pursuit? What would John Wesley say about (after-birth) abortion and the sale of baby body parts? What would George Whitefield say? What would Jesus say? Why should Evangelicals have to evidence support for the Bishop’s priorities in order to earn his assent that they may style themselves ‘Evangelical’? And how does he know they don’t share his priorities? Seriously, what can Paul Bayes possibly know about the good works which these so-called Evangelicals do in private? They may very well feed the starving and house the homeless, but are simply not given to doing so for an easy headline. They may not be doing these things, of course, but the point is that the Bishop of Liverpool is judging them by what he reads in an essentially hostile media, which is a fairly crude assessment of a person’s faith or ministry. His gospel focus is manifest: the stain of sin on humanity, the need for repentance, the glorious work of Christ on the Cross, the wonder of salvation, and the singing, dancing and leaping for joy when you are born again. Gosh, these so-called Evangelicals get everywhere, don’t they?